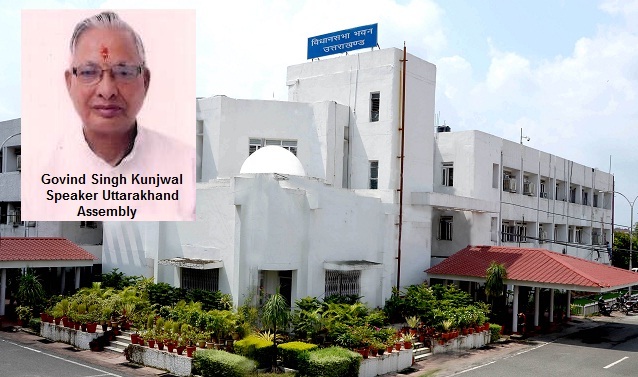 Dehradun: Uttarakhand Speaker Govind Singh Kunjwal has served notices to 9 rebel Congress MLAs asking them why they should not be disqualified from the membership of the House for violating the party whip and alligning with opposition BJP. After the rebel MLAs, elected to the House on Congress ticket, threw their weight behind the main opposition BJP, the Speakers’s notice is being questioned on the ground that it comes after 35 MLAs, 26 of the BJP along with the 9 rebel Congress MLAs had already given a no-confidence motion against the Speaker. The Speaker’s action against the rebel legislators comes in response to the demand by State Legislative Affairs Minister chief whip of Congress legislature partyIndira Hrideyesh, who has sought action aganst the MLAs holding them responsible for disobeying the party whip. State Governor Krishna Kant Paul has asked chief minister Harish Rawat to prove his majority on the floor of the State Assembly by March 28. In the meanwhile, Congress Vice President Rahul Gandhi has taken the Prime Minister and the BJP head on. He said today that the Uttarakhand crisis has exposed the “true face of Modiji’s BJP”. He asserted that the Congress would fight this “demagoguery with democracy”. The attack on our democracy & Constitution, first in Arunachal & now Uttarakhand, is the true face of Modiji’s BJP, the Congress Vice President said.